Cagney's apparently not the type of dog to make much ado out of situations that are truly life-threatening. In fact, to look at her now, you'd probably never guess that just days ago she was nearly eaten alive by a reclining chair. 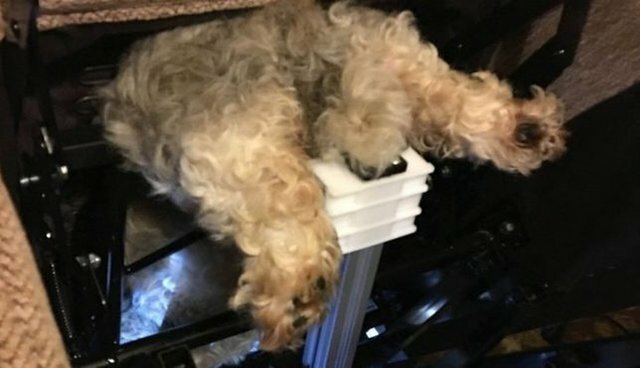 It's unclear exactly how the pup came to be trapped in the jaws of that notoriously dangerous living room furniture piece, but she was powerless to escape its grip on her own. Cagney's owner, Lyn Kirkwook, told the Royal Society for the Prevention of Cruelty to Animals (RSCPA) that she had been missing for about an hour inside their home in Swinton, England. "I looked in all the rooms and couldn't find her anywhere, then all of a sudden I heard a whimper and we found her stuck in the chair," Kirkwood said in a release. Fortunately, help was soon on its way. Animal welfare officer David Hatton, along with firefighters from Greater Manchester Fire and Rescue Service, were called out to extract the dog from the seat's steely innards. "She was stuck head first in the mechanism, with just her back legs sticking out," Hatton told the RSPCA. "I've never seen anything like it." The first responders quickly set about dismantling the reclining chair, careful to avoid causing the dog any injuries in their attempt to free her. After about a half an hour, their efforts paid off as Cagney was finally able to wiggle free. But while the successful rescue was no doubt rife with drama for all the people involved, the chair's fluffy victim was surprisingly serene. "Afterwards she seemed pretty unfazed by the whole thing, she just wandered off for a drink and came and sat by her owner," Hatton said. The Greater Manchester Fire and Rescue Service confirmed on Facebook that Cagney did make a full recovery. Sadly, however, pets who've gotten trapped in these types of chairs aren't always so lucky. Reclining chairs can pose a real danger to animals. Small dogs and cats may be prone to hide inside these devices, where they can easily become injured or fatally crushed when someone sits down, rocks or uses the reclining mechanism. Pet owners with these chairs should always check to make sure their animal is not inside before reclining or closing the footrest.